Millions of people in the Northeast and the mid-Atlantic states were hit hard by Hurricane Sandy. One of the largest storms ever to reach the East Coast, Hurricane Sandy stretched nearly 1,000 miles (1,609 km) wide. Officially deemed a “post-tropical cyclone,” it brought pounding winds, rain, and flooding to some of heavily populated areas in the nation. The center of the storm came ashore on October 29, 2012, near Atlantic City, New Jersey. Coastal areas, including parts of New York City and New Jersey, were flooded by huge surges of seawater, made worse by high tides and full moon. The storm caused at least 130 deaths in the United States and Caribbean, and billions of dollars in damage. 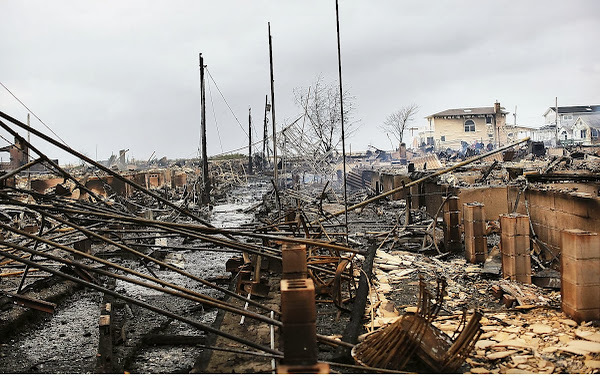 President Barrack Obama declared New York and Jersey disaster areas, which made federal aid available to the states for rebuilding. “All of us have been shocked by the force of Mother Nature,” Obama said. Chicago teachers march in protest. On September 10, 2012, thousands of teachers in one of the nation’s largest school district left their classrooms. After 10 months of discussions, the Chicago Teachers Union (which represents the teachers) and the city government could not agree on a contract. So about 26,000 teachers went on strike. Classes were canceled for more than 350,000 students in the city’s public schools. The teachers were protesting what they called unfair work conditions. They said the biggest issues were health benefits, job security, poor classroom, and teacher evaluations. After a week, union leaders agreed that proposed contract had enough changes for teachers to return to work. The school district made changes to how closely teacher evaluations were tied to student test scores, and offered better opportunities for teachers who are laid off due to budget cuts. The new contract also included a longer school day and pay raises for teachers. 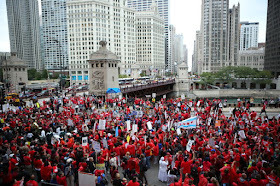 The 2012 teacher's strike was the first one in Chicago in 25 years. Starting in 2013, 40 public schools in Colorado, Connecticut, Massachusetts, New York, and Tennessee will each add at least 300 hours of learning time to their calendar. “Adding meaningful in-school hours is a critical investment that better prepares children to be successful in the 21st century, “said the U.S. Secretary of Education Arne Duncan. In November 2012, U.S. citizens reelected President Barack Obama and the Vice President Joe Biden to a second term. They triumphed over Republican presidential candidate Paul Ryan. When all the votes were counted, President Obama had won 332 electoral votes to Romney’s 206, well over the 270 electoral votes he needed to win. He had a total popular vote count of more than 62.6 million votes to Romney’s 59 million. President Obama was able to declare a decisive victory on the evening og Election Day, November 6, 2012. But it took the state of Florida four days to count al its votes. When it was done, its 29 electoral votes went to Obama. The President won Florida’s popular vote by less than 1%. The 113th Congress of the United States began its term on January 3, 2013. These senators and representatives will remain in office together until January 3, 2015. As of February 2013, thus Congress consisted of 232 Republicans and 200 Democrats in the House of Representatives; and 53 Democrats, 45 Republicans, and 2 Independents in the Senate. For decades, childhood obesity rates have been on the rise. Now some U.S. cities, including Philadelphia, New York and Los Angeles, are seeing progress in their fight against fat. Declining childhood obesity rates have also been reported in the parts of Mississippi, the state with the highest rate in the nation. Thank you for reading What's in the News? Around the United States posted on the website Kwentology if you want to redistribute this article please include the link as the source. Have some kuwento to share? Contact us!